(Los Angeles, CA) As previously announced, legendary guitarists JOE SATRIANI and STEVE VAI have laid plans for a second benefit concert supporting music industry veteran and friend, Cliff Cultreri. 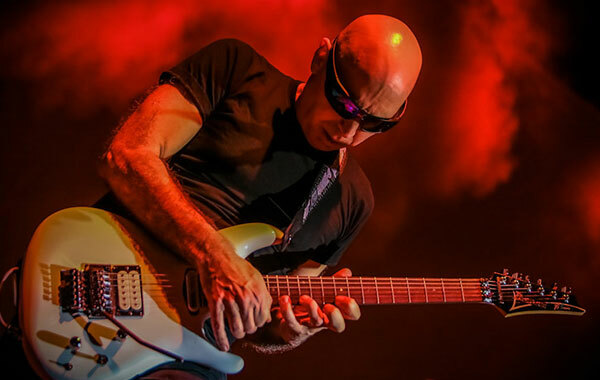 “A Benefit for Cliff II” will take place on Sunday, July 10th at the House of Blues, Hollywood, and will feature performances by both Satriani and Vai, as well as special guests and friends of the duo, including Dweezil Zappa, Orianthi, Brendan Small and Tony MacAlpine, among others. In addition to this extraordinary musical event, Satriani, Vai and others have graciously donated various items to be auctioned that evening. Among these items are: Steve Vai signed 20th Anniversary JEM guitar commemorating the entire line of Ibanez guitars. Steve used this guitar for the duration of the 2007 “String Theories Tour”. and on the Grammy Nominated song “Now We Run”, featured on the Platinum award-winning DVD “Where The Wild Things Are”. Other auction items include Joe Satriani JS1000 guitar with personalized art, Joe Satriani JS1200 guitar autographed by all the musicians, and a Paul Gilbert autographed guitar. Cliff Cultreri is the A&R executive who ‘discovered’ both Satriani and Vai, as well as many other popular recording artists, while working at Relativity Records and Koch Entertainment. Cultreri is suffering from a host of Auto-Immune and Connective-Tissue disorders that are simultaneously attacking his immune system, a 1 in 100 million occurrence that causes severe pain and physical debilitations. During his years in the industry, Cultreri has served as A&R for a number of top names including Allan Holdsworth, Billy Sheehan & Talas, Peter Frampton, Megadeth, Corrosion Of Conformity, Exodus, Anthrax, Death, Venom, Slash’s Snakepit, My Bloody Valentine, The Cure, Modern English, Gene Loves Jezebel, Fat Joe, Common, Bone-Thugs-N-Harmony, 3-6 Mafia, KRS1, Beatnuts, C Murder, Kurupt, Soulja Slim, RZA, and many others in all genres of music. In 2006, Satriani and Vai joined forces for the first Cultreri benefit show. They raised money as well as attention to the devastation this disease takes out on both the patient and their family. Satriani and Vai hope to raise even more funds with this year’s benefit to help Cultreri and his family’s financial needs. “Steve and I are looking forward to jamming with friends and raising money for our friend Cliff,” said Satriani.